I’ve received many questions recently about creating and using email signatures. I’ll try to give you a few suggestions on how you can create your own super-cute signatures and how you can get them to work in Groupwise. Decide what you want your signature to say and if you want to include a graphic. Set up your Signature in Groupwise. Now that we are using Outlook, the directions have changed! You should definitely include your name, but what else? Perhaps you should include your campus name, job title, phone number and extension? There’s no need to include your email address since this will be attached to an email from you, but you could include the URL for your class or campus website. Many people like to include pictures or graphics. Try to keep them relatively small and not too distracting. You will also want to keep them education-friendly! Click here to see several blank Email signature files. You can download them to your computer and use them to personalize your very own siggy! 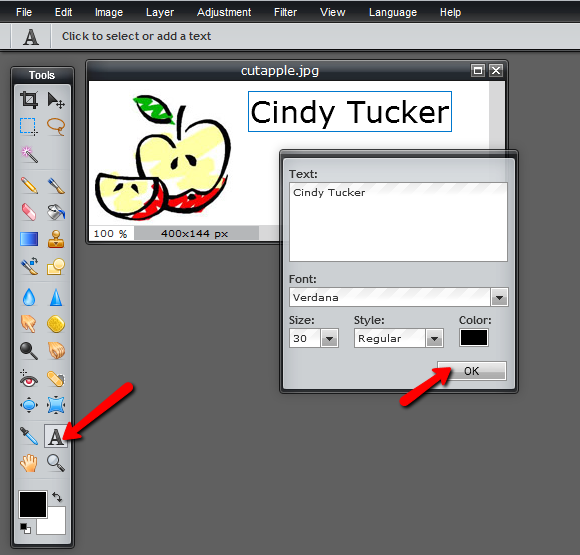 Click the Text tool, click into the body of the signature file. Enter and edit your text in the pop-up box. To move the text, click the Move tool (top, right tool on the tool palette), and then click and drag your text. The Layers palette (on the right side of the screen) shows you each different “layer” or item you add to your Pixlr workspace. If you need to select a specific part of your design, select it by clicking on the layer in the layers palette. Step 3 – Set Up in Groupwise Check out this post about how to set up your signature in Outlook 2010! 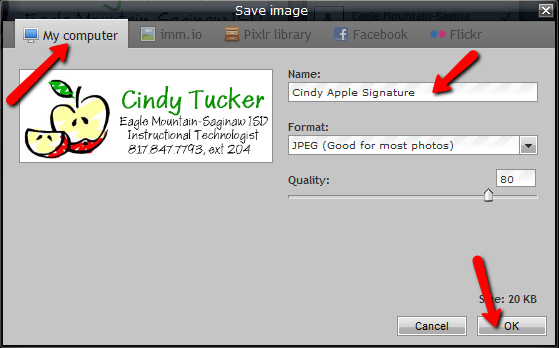 Choose Insert Picture, then Browse to find your saved signature image. Alternate Text, Layout, and Spacing information is optional. Click OK.
After you set it up, send an email to yourself (your school address) to see if it works.